A small ‘problem’ with my bulb bed is that for much of the year, the spring flowering bulbs are resting. This makes it tricky to add new bulbs in the autumn without disturbing the ones already there. So I decided I would have to cover the bed in labels, marking existing residents. Now as you have all probably found, those cheap but useful white plastic labels become illegible after a few months. Something more permanent was required. At £4, the post and packing charge is a bit pricey, but at just over £8 for a hundred labels, plus another 30p for the marker (you scratch the name on), it will be money well spent (if it works of course). It took me half an hour to ‘write’ 24 labels, so probably a job for a winter evening or a rainy day. PS. 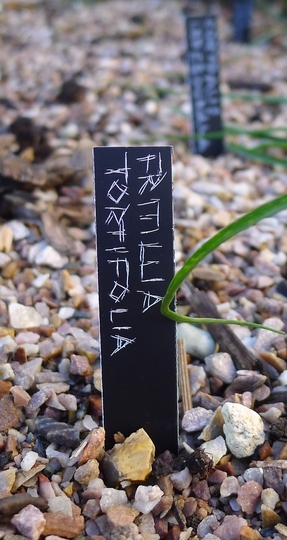 I’ve just noticed the mistake on this one – it should read ‘fritillaria’ – whoops! That's interesting. Reminds me of those pictures we used to call scraperboards. No rubbing out your mistakes though! a nurseryman in the New Forest by the name of Douglas Lowndes marketed these 30 odd years ago they still sell them I can vouch for there long life but wish they made them longer everything enjoys pulling them out of the ground , I have experimented with a piece of wire about 8in long bent over double threading it through the hole and pushing it into the ground ahead of the label ,it was a bit better. Yes, a very good idea.......make sure you get it right first time , though!!! We bought ours from the lovely nursery MacPennys, such charming people, even gave us some free ones to practice on!! only problem is put them in a safe place!! yes, you guessed, still looking!! These look to be a good idea. I bought a labelling machine but after a year the glue on the labels is breaking down and they are peeling off the plant label sticks. I will def consider buying these next year. Thankyou for putting the info on.